The assassination of former President Burhanuddin Rabbani is a signal of things to come: the Taliban have demonstrated that they have upper the hand over the Afghan military and police. The Taliban have shown that they are not weakening and that they will not settle the conflict in Afghanistan on any terms but their own. They want Afghanistan for themselves and they have shown, over the course of the last month or so, that they can wrangle with any comers who want to take them on in a fight. Indeed it’s not at all unlikely that this is the first volley in what may be a relapsed civil war that has already immiserated Afghanistan for many decades. Rabbani, an ethnic Tajik and a former leader of the anti-Taliban Northern Alliance, had served as head of the Afghan High Peace Council, the group tasked to work out a negotiation between the battling sides. Rabbani managed to convince his former colleagues and other leaders of the Northern Alliance that it would be in their interest to negotiate with their enemy, the Taliban. With his murder, there can be little doubt that many Afghan leaders are squarely facing the prospect of a new turn at civil war that has destroyed the social, economic and political fabric of Afghanistan over the course of the last thirty years. Rabbani’s assassination is therefore thoroughly political. It is a declaration that not only is the U.S. led peace effort doomed to fail, but that the Afghan led effort to reconcile the Taliban with Kabul will also fail. (Perhaps it is a declaration that the peace effort has already failed.) The U.S and its NATO allies had then better rethink their exit strategy out of Afghanistan, the Taliban seem to taunt: not even those considered out of reach are truly out of reach. Indeed Rabbani’s assassination smacks a little of the September 2001 assassination of Northern Alliance leader Ahmed Shah Massoud–two days before the al Qaeda sponsored 9/11 attacks on U.S. soil. Shah Masoud’s assassination demonstrated that the Taliban had cleared the way for a period of unchallenged rule. It declared the end of the civil conflict that had riven Afghan politics to the core-Pashtun tribes seemingly against nearly everyone else. Despite the 2001 U.S. invasion which finally (and many thought truly) ended the civil war in Afghanistan Ahmed Shah Masoud’s assassination nevertheless structured the politics to Afghanistan for the last ten years. Consider that were Ahmed Shah Masoud still alive Hamid Karzai might today be some provincial governor of little note or regard. Burhanuddin Rabbani’s murder in his own home in what many consider to have been the safest neighborhood in Kabul is a loud declaration that not even Kabul, thriving politically and economically under President Karzai’s hub of influence, is outside the reach of the Taliban. It is a declaration that everyone is fair game-even reformed and respected political leaders like Rabbani who credibly cast himself as a peacemaker in this iteration of Afghanistan’s contested politics. He seemed to embody the very hope that Afghanistan might surmount its current run of internecine conflict. Rabbani’s assassination, and the removal of his presence and the moral weight of his views burnished by his decades long anti-Soviet leadership, has now made the negotiations between Kabul and the Taliban a blatantly, naked partisan affair. It is a declaration which can have only one logical consequence: war, dressed up in its urban, civil disguise. 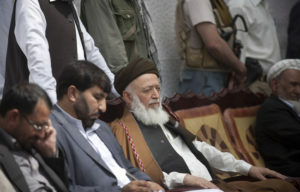 The leaders of the Northern Alliance including former presidential candidate Abdullah Abdullah have declared that Rabbani’s assassination proves that the Taliban will not negotiate militarily or politically. That it does no good to call an insurgent a ‘dear brother’ as President Karzai is wont to do. Rather the Taliban seem to be gearing up for civil war, one they intend to win by fighting in way that no well-trained military can counter–much less an inchoate and incompetent one like the Afghan military tasked to take over the security operations of Afghanistan entire in two years. It’s a good bet that the Taliban will attack Afghan leaders when least expected in a manner that is most unexpected. It has been reported that Rabbani was assassinated by a suicide bomber who hid explosives in his turban. Indeed reports suggest that the man was allowed into such close proximity with the aged leader that moments before he was killed Rabbani’s assassin embraced him warmly. Given the means by which Rabbani was killed no one could have stopped the attack. The Taliban’s strategy now seems to be to fight in a way that no one– not even U.S and ISAF soldiers– can stop them. The recent 20 hour siege against the U.S Embassy and a NATO base suggests just that strategy: surprise urban guerilla warfare. It’s not so much that the Taliban attacked international institutions; it’s that they humiliated the supposedly well-trained Afghan military stationed in and around Kabul.Thus the target of their attacks and therefore their scorn seems to be the Afghan military and Afghan leaders-in short any standing Afghan institution. There can be little doubt that Afghan and U.S officials are now increasingly wondering whether President Hamid Karzai might soon become a member of that list.